TORONTO (Aug. 4) — Let’s assume, for a moment, the Maple Leafs brought Patrick Marleau aboard with his imprudent contract in order to contend for the Stanley Cup beginning next season. Such would appear as the unspoken plan, knowing how difficult it will be to maintain key roster components two years from now — in the summer of 2019 — when Mitch Marner and Auston Matthews join William Nylander off entry–level salary restriction. To this point in the current summer, the Leafs have made three changes; two of which are direct replacements: Dominic Moore at center for Brian Boyle (signed as a free agent by New Jersey) and Ron Hainsey on defense for Matt Hunwick (signed as a free agent by Pittsburgh). That leaves Marleau to displace one member of the roster that encountered the Washington Capitals on Apr. 23, when the Leafs last played and were eliminated from the first round of the Stanley Cup tournament. As you can see, only two players — Matt Martin and James van Riemsdyk — were listed as left–wingers. Also manning the position that night, however, were Zach Hyman and Leo Komarov. Though Marleau is listed at center on the Leafs official website, he’ll undoubtedly see much time at left–wing to alleviate a dearth of scoring on that flank. Hyman and Martin are all–but guaranteed regular duty with contracts that extend beyond next season. JVR, if not dealt in the interim, will also be a prime figure on the port side. So, where does that leave the pugnacious Uncle Leo, whose $2.95–million salary–cap hit expires next summer? The easy solution, financially, is to trade JVR and keep Komarov. 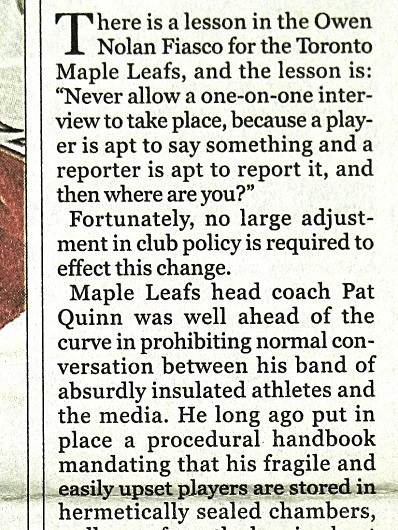 But, that exchange would weaken the hockey club up front and counter the “go–for–it–now” mentality. A team acquiring van Riemsdyk’s contract will control him for only next season. The return for the Leafs, therefore, would almost certainly not be commensurate in value — even if the club were to pick up another warm body on the blue line. If the Maple Leafs are indeed convinced they can take a second big leap in the standings, wouldn’t it make sense to retain van Riemsdyk and Tyler Bozak (also with one contract year remaining) until at least the NHL trade deadline next March? That duo, two–thirds of the club’s most reliable forward unit (with Marner on right–wing), finished second and sixth, respectively, in team scoring — combining for 47 goals and 117 points. Komarov had 14 goals, five less than during the 2015–16 schedule. As such, trading him for a third or fourth–round draft pick is considerably more logical. Another possibility, and I wouldn’t wish it on a dog, is for Uncle Leo to occupy “Robidas Island”, the oasis of purgatory named after exiled defenseman Stephane Robidas; also inhabited by by winger Joffrey Lupul. Given his competitive zeal, however, Komarov likely has some trade value. Moving him would create a more steady opening for either Josh Leivo on left wing or Nikita Soshnikov on the right flank — both of whom were scratched for the Leafs last playoff encounter. Perhaps for prospect Jeremy Bracco, should the smallish right–winger prove worthy of NHL deployment. 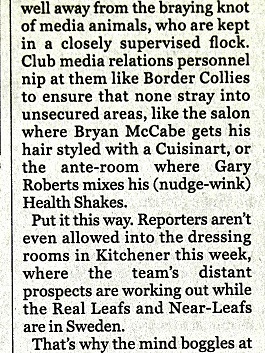 Otherwise, the Leafs ought to stay right where they are. Frankly, I’ve never understood the “get rid of JVR and Bozak” mentality. Divesting the club of van Riemsdyk (and his 29 goals from last season) would thoroughly offset the addition of Marleau. It makes no sense whatsoever. 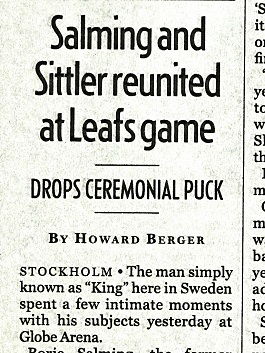 Bozak’s 55 points, and his increasing wizardry in the face–off circle, would also be sorely missed. Unloading either or both will merely free up some cap space. But, only for the coming season. Why not hang onto them; assess the club at the trade deadline… and then make a decision. 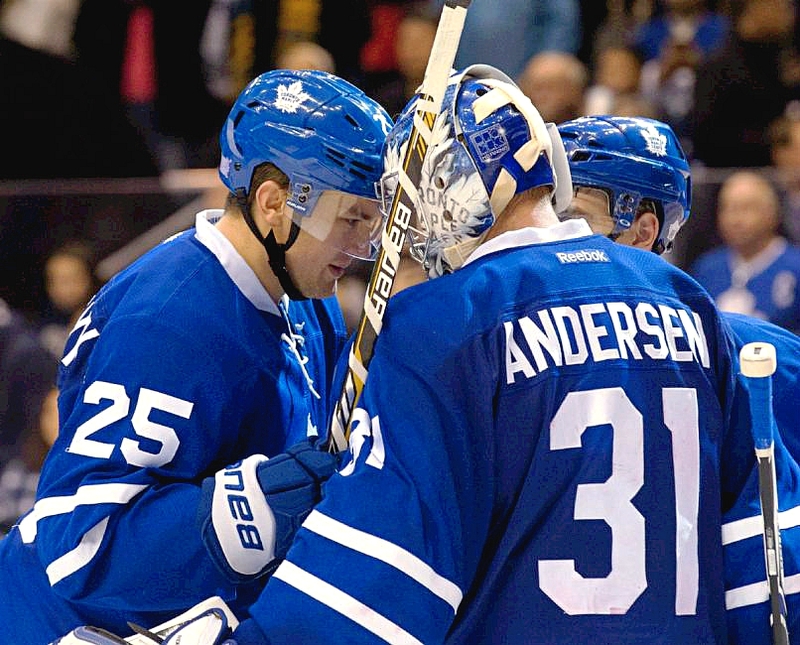 If the Leafs are soaring, you stand pat and vie for a lengthy playoff run. Which seems to be the impetus for signing Marleau, at 38. So what if Bozak and JVR “walk” after next season? It’s not as if the Leafs will garner a decisive return by trading them now; and fans will happily see them off if the club wins one or two playoff rounds. The first puck drops two months from tonight (Oct. 4), in Winnipeg. Bozak and JVR should both be in uniform for the visitors. Oh my, here’s a memory. 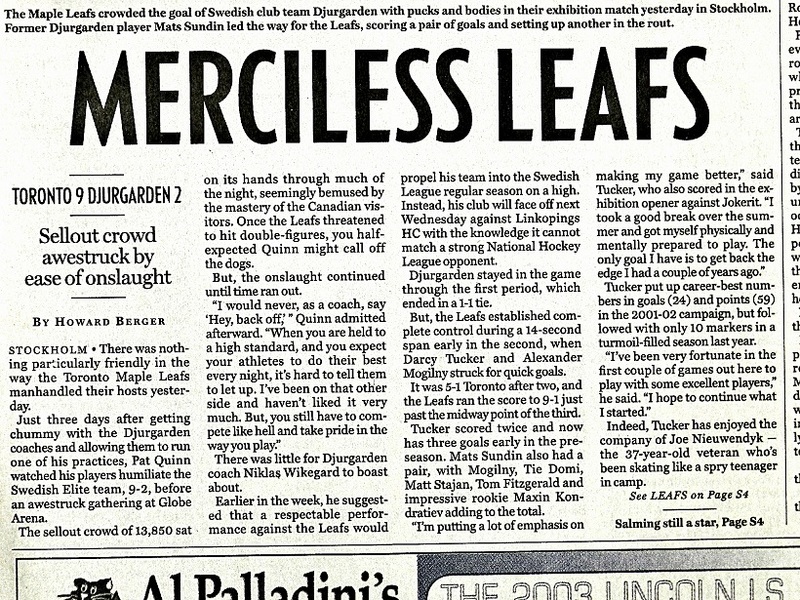 I came across this sports section from The National Post of Sep. 19, 2003. I’ll never forget seeing the newspaper as I boarded an Air Canada Airbus–330 at Charles de Gaulle Airport in Paris the following day. 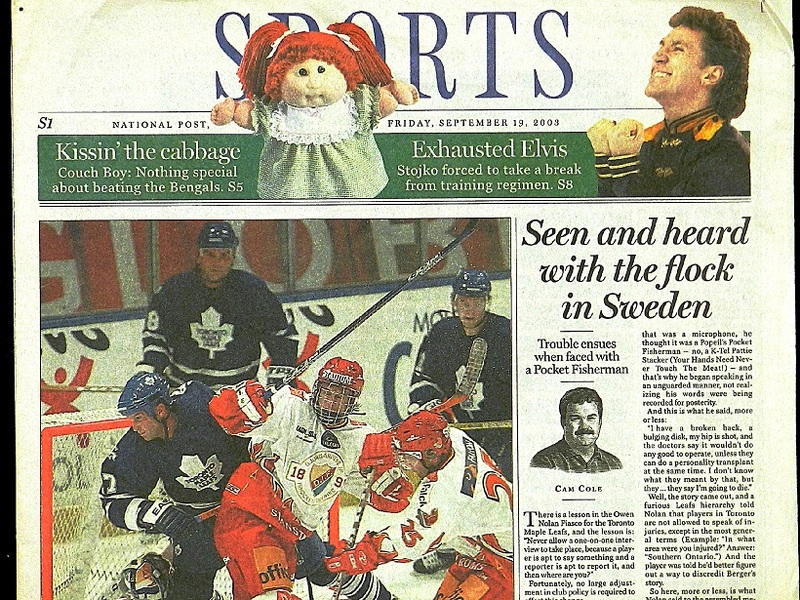 I had flown to Paris from Stockholm for my connection to Toronto after covering the first week of the Maple Leafs training camp for The FAN–590 and the Post in Sweden — home of the club’s renowned captain, Mats Sundin. 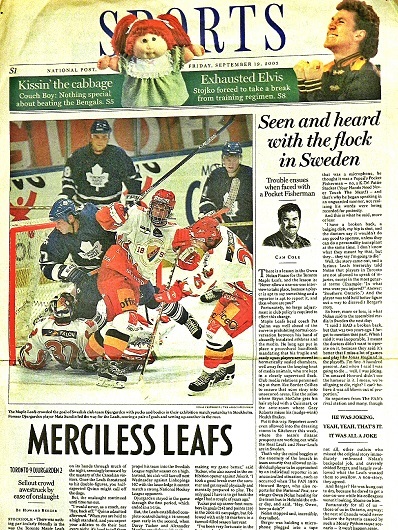 The Leafs played exhibition games in Stockholm against Swedish Elite League teams Djurgarden and Farjestads. And, another friendly in Helsinki against Jokerit of Finland. 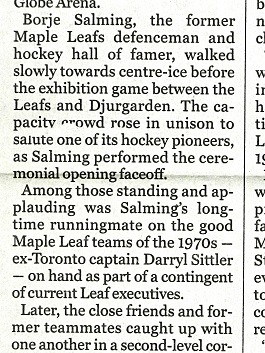 It was following the latter match that I interviewed Leafs veteran Owen Nolan… and stumbled on a fairly big story. I was neither looking for Nolan nor anticipating the questions I would ask. I simply needed a one–on–one interview with a Leafs player for the radio station and Owen happened to be first out of the dressing room at Hartwall Arena. 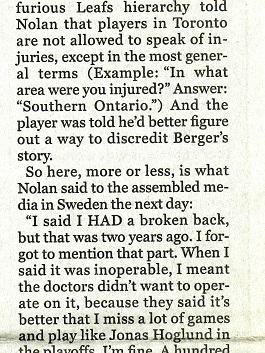 During the course of an otherwise innocuous chat, I wondered about Nolan’s notoriously painful back, which dated to his years with the San Jose Sharks. 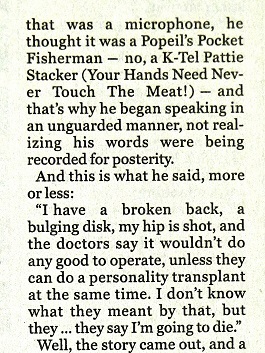 When he replied, on tape, that he would need surgery “because my back will soon explode”, I knew I had acquired something exclusive. 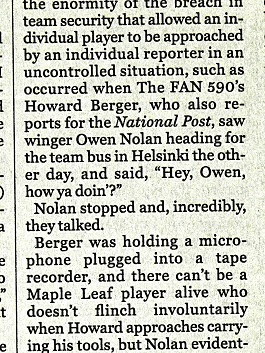 From my hotel room in Helsinki, I sent the interview to The FAN–590, and several wraparound reports with Nolan’s voice for our top–of–the–hour sportscasts. As I had done after hundreds of Leaf games on the road. I then packed my overnight bag for a return puddle–jump to Stockholm in the morning. Once back in Sweden, I was Public Enemy No. 1 with the Maple Leafs… and my media colleagues on the trip. For what, I had no idea. 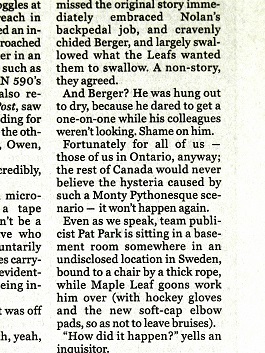 Then it came out the Leafs were denying my story and would march Nolan before TV cameras to further explain. 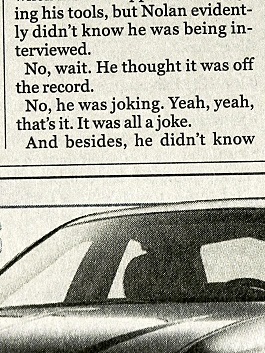 Said I to myself: “How can they deny a story I have on tape from Nolan’s own mouth?” Nonetheless, Owen put an entirely different spin on the words he had spoken to me roughly 15 hours earlier. 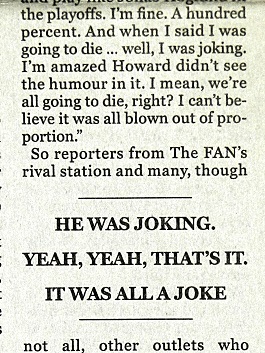 Manned with the updated version, in which he denied saying his back would “explode”, I found a seat in the empty Globen Arena and asked a producer back at the radio station in Toronto to tee up Nolan’s version from Finland. I would then go on live with Mike Hogan and play the tape of his rebuttal. Needless to say, one completely contradicted the other. I did, however, apologize for causing him grief. We shook hands and never had another issue. The JVR-Bozak-Marner line was the most irresponsible line on the team. The coach didn’t trust them and even with soft offensive zone starts against easier competition, they leaked shots against at a greater rate than any of the other forwards. Yup. 68 goals and 178 points. Lousy line indeed. Sigh.